Two masses, 10-12 tons and 5.5 tons, were found in March 1966, lying within only very slight depressions in clayey soil, Met. Bull., 1967, (39), Meteoritics, 1970, 5, p.90. Three smaller masses of Premier Downs, assigned to this shower, were found in 1911 and 1918; the larger mass of Mundrabilla is in Perth (Western Aust. Mus. ), the smaller mass went to Adelaide, then to Heidelberg for cutting and distribution, A.L.Graham et al., Cat. Met., p.249. Analysis, 7.79% Ni, 60 ppm Ga, 171 ppm Ge, J.R.de Laeter, Meteoritics, 1972, 7, p.285. Description, P.Ramdohr and A.El Goresy, Chem. Erde, 1971, 30, p.269. 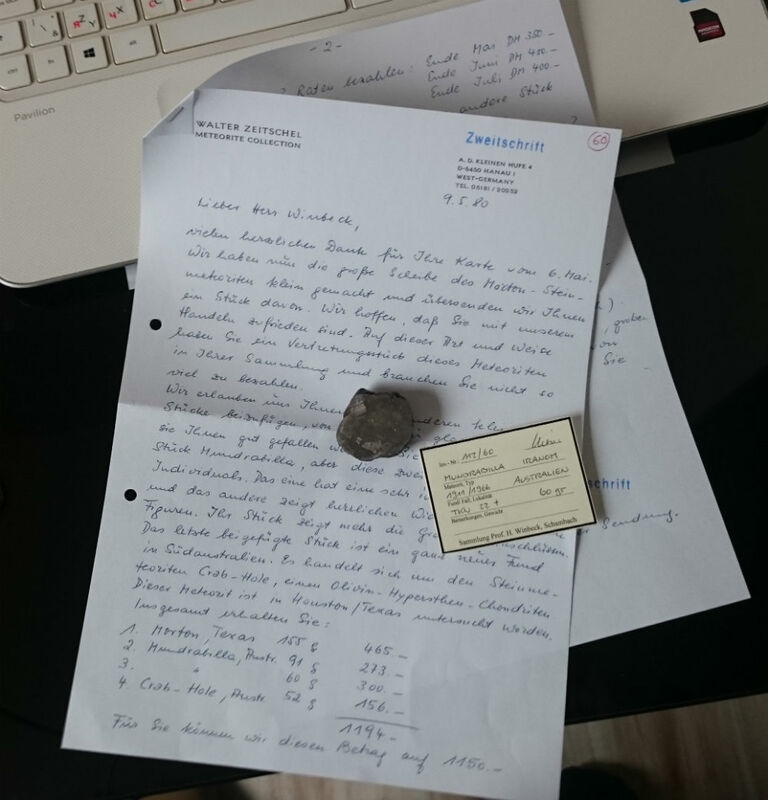 Al-26 activity, H.Kammer, Meteoritics, 1973, 8, p.393 (abs.). Noble gas data, T.Kirsten, Meteoritics, 1973, 8, p.400 (abs.). Cd and Zn abundances, K.J.R.Rosman and J.R.De Laeter, GCA, 1974, 38, p.1665. Further analysis, chemically anomalous, 7.72% Ni, 59.5 ppm Ga, 196 ppm Ge, 0.87 ppm Ir, J.T.Wasson, Meteorites, Springer-Verlag, 1974, p.307. Mineralogy of silicate inclusions, P.Ramdohr et al., Meteoritics, 1975, 10, p.477 (abs.). Full description, V.F.Buchwald, Handbook of Iron Meteorites, Univ. of California, 1975, p.858. 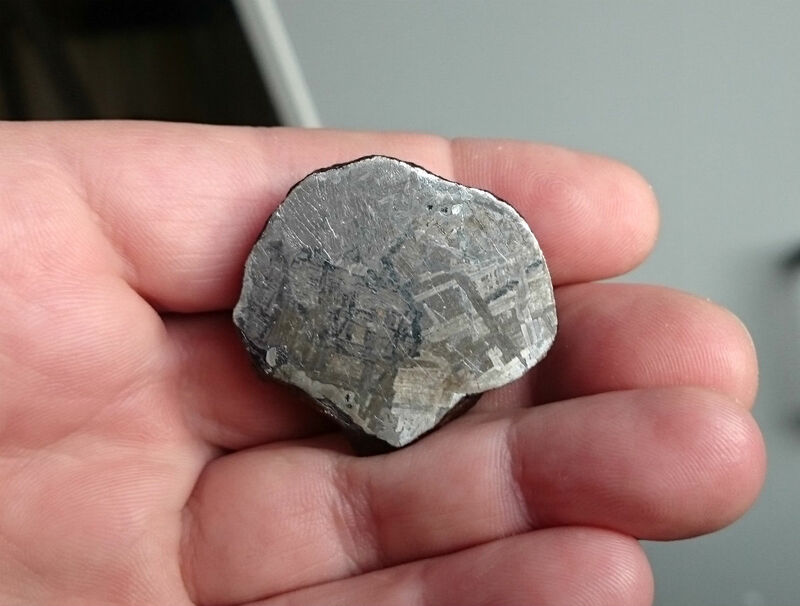 Mineralogy, P.Ramdohr, Fortschr. Min., 1976, 53, p.165. Distribution of Mn-53 in meter-sized slabs, W.Hampel and O.Müller, Meteoritics, 1977, 12, p.249 (abs.). Analysis of silicates in troilite nodules, olivine Fa3, K.L.Robinson and R.W.Bild, Meteoritics, 1977, 12, p.354 (abs.). Major and trace element analysis of metal and troilite, H.H.Weinke, Meteoritics, 1977, 12, p.384 (abs. ); see also, Meteoritics, 1978, 13, p.665 (abs.). I-Xe dating of troilite, S.Niemeyer, GCA, 1979, 43, p.843. Ar-Ar age of silicate inclusions, 4.57±0.03 Ga, S.Niemeyer, GCA, 1979, 43, p.1829. Oxygen isotopic composition, T.K.Mayeda et al., LPSC, 1980, 11, p.694 (abs. ); see also, R.N.Clayton et al., LPSC, 1983, 14, p.124 (abs.). Two further masses, of about 840kg and 800kg, were found in 1979, 1.3 km apart and 20 km E of the site where the other two large masses were found, J.R.De Laeter and W.H.Cleverly, Meteoritics, 1983, 18, p.29. Ag and Cd isotope data, J.H.Chen and G.J.Wasserburg, LPSC, 1983, 14, p.101 (abs.). Pb isotopic composition of metal and sulfide, J.H.Chen and G.J.Wasserburg, LPSC, 1983, 14, p.103 (abs.). Pb isotopic composition, C.Göpel et al., Meteoritics, 1983, 18, p.303 (abs.). U-Pb systematics, C.Göpel et al., GCA, 1985, 49, p.1681. Uranium content and track densities in troilite, D.E.Fisher, Meteoritics, 1985, 20, p.37. Sphalerite composition, S.A.Kissin et al., GCA, 1986, 50, p.371. Si isotopic composition of silicate, C.Molini-Velsko et al., GCA, 1986, 50, p.2719. Ag and Pd isotopic composition, J.H.Chen and G.J.Wasserburg, GCA, 1990, 54, p.1729. Determination of concentration profiles of Fe, Co, Ni, Cu, Ga, and Ge by PIXE, S.Bajt, Meteoritics, 1991, 26, p.314 (abs.). Be-10 and Mn-53 data, K.Nishiizumi et al., Meteoritics, 1991, 26, p.379 (abs.). Sulfur isotopic composition of troilite, X.Gao and M.H.Thiemens, GCA, 1991, 55, p.2671. Bidirectional reflectance spectrum of troilite, D.T.Britt et al., LPSC, 1992, 23, p.167 (abs.). Mn-Cr systematics for alabandite, I.D.Hutcheon et al., LPSC, 1992, 23, p.565 (abs.). New analysis, discussion of classification, M.Hoashi et al., Chem. Geol., 1992, 98, p.1. 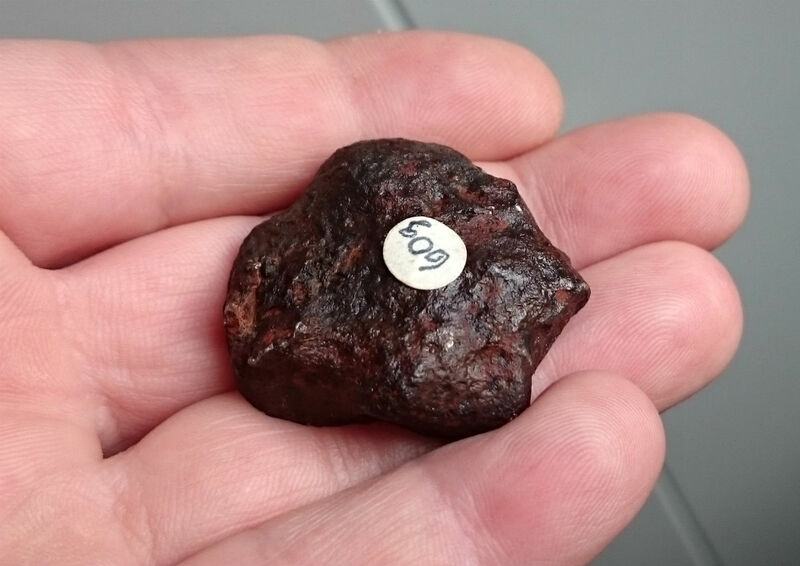 Two further masses of about 2000kg and 550kg were found, R.Haag, priv. comm. to J.Koblitz, 1994. Further analysis and classification, an anomalous member of group IIICD, B.G.Choi et al., GCA, 1995, 59, p.593. Interpretation of macrostructural features as casting under microgravity, P.Z.Budka et al., LPSC, 1997, 28, p.173 (abs.). Ge isotopic composition, T.Hirata, GCA, 1997, 61, p.4439. Ion probe analysis of carbon and nitrogen distribution in taenite and kamacite, N.Sugiura, MAPS, 1998, 33, p.393. Petrology of silicate-bearing inclusions, G.K.Benedix et al., MAPS, 2000, 35, p.1127. New classification: an ungrouped member of the IAB complex, J.T.Wasson and G.W.Kallemeyn, GCA, 2002, 66, p.2445. 3D characterization using CT imaging, D.C.Gillies et al., LPSC, 2003, 34, abs. #1666. LA-ICP-MS analysis, M.I.Petaev and S.B.Jacobsen, MAPS, 2004, 39, p.1685.